Snocks No Show Socks Men Mens Bombas Low Cut Invisible Loafer Black Size 9 10 11 by Snocks at Mas Fashion. Hurry! Limited time offer. Offer valid only while supplies last. 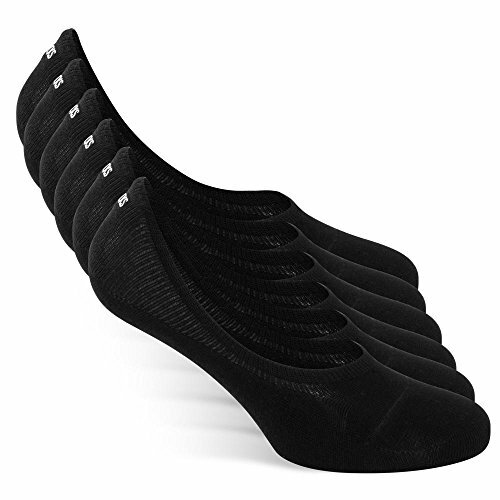 ANTI-SLIP: Don't worry about your socks slipping anymore: due to our ground-breaking, anti-slip silicone heel stripe in our unisex no-show socks, they stay put and won`t slip the whole day! INVISIBLE: Don't let visible socks ruin your outfit anymore: due to the low-cut design of our no-show socks, they are always invisible while wearing and keep your feet dry and cool all day. These footies in size 3-14 are the perfect socks for your every sneaker. BEST QUALITY: In our opinion, you deserve the best - so don't be satisfied with average. Our breathable, cotton-rich invisible socks will never shrink or pill - these soft socks are perfect for everyday wear, won't loose shape and are easily washable! 30 DAY TRIAL: Customer satisfaction is very important to us: take your time and get to know us! Test all of our products for 30 days. If you do not like them, return them and get a refund immediately - It's as simple as that! ANTI-HOLE: Durability is our ambition: our invisible socks come with an anti-hole-warranty that is valid for 6 months. In case of a hole, contact us and get a new pair of SNOCKS right away! If you have any questions about this product by Snocks, contact us by completing and submitting the form below. If you are looking for a specif part number, please include it with your message.